Traffic backed up for miles due to a fatal accident on Main Road in Holden in this April 20, 2017, file photo. State transportation officials are planning changes along a busy section of Route 1A in Holden that has been the site of traffic jams and crashes in recent years. 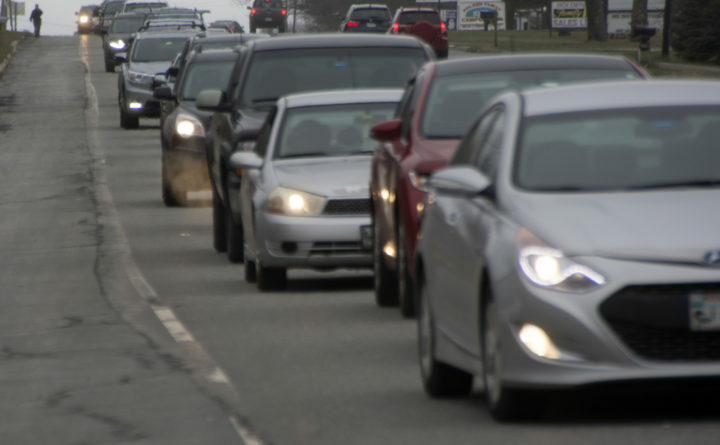 The work would expand two sections of Route 1A, totaling about 1.5 miles, to include two travel lanes and a center lane for drivers turning left from either direction, according to Ted Talbot, a spokesman for Maine Department of Transportation. Right now, the road includes two lanes with no center lane. Also called Main Road, Route 1A carries many travelers to Mount Desert Island in the summer. The exact date of the project is not clear. Maine DOT documents say the work is scheduled for 2019 or 2020, but Talbot did not immediately respond to an emailed request for a more specific timeline. The upgrades will cost an estimated $1.5 million and are meant to improve the safety of that section of road, according to Maine DOT. Talbot did not provide an explanation of the exact reasons for the project. The project will add center lanes along two sections of Route 1A. One is just over a half mile, starting near the Maine Military Supply store and continuing southeast to the intersection with Copeland Hill Road. The other is almost a mile, starting near the Holden Town Office and continuing east to the intersection with South and Bagaduce roads. During the warmer months, he sees recreational vehicles that are driving east and waiting to turn left into a campground that is near the town office, causing other vehicles to back up behind them. “Hopefully it will help to ease congestion on Route 1A,” Breadmore said. The stretch of Route 1A from Holden to Ellsworth is also regularly traveled by emergency responders, as numerous crashes have happened there in recent years. In April 2017, an Orland man died after his vehicle crossed into the opposite lane near Maine Military Supply and was struck by a tractor-trailer, according to police. The crash shut down the road for almost four hours. Other crashes, at least one of them fatal, have been reported on the state highway in Holden. There also have been multiple deadly accidents on Route 1A in the neighboring town of Dedham. Rumble strips were installed on the road in 2015, according to Maine DOT. On Monday, the agency did not respond to a request for data on how many crashes have been reported in recent years on Route 1A in Holden.